Husk, at 76 Queen Street, was opened by Executive Chef/owner Sean Brock in November 2010. Led by Brock and Chef de Cuisine Travis Grimes, a Lowcountry native, the kitchen reinterprets the bounty of the surrounding area, exploring an ingredient-driven cuisine that begins in the rediscovery of heirloom products. Husk occupies adjacent renovated spaces on Queen Street. 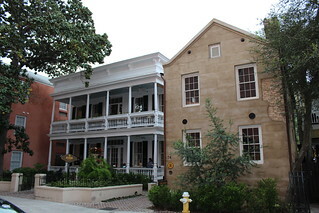 The two-floor main dining house house, constructed in 1893, with its Victorian details and turned columns layered over an original Queen Anne-style facade is fronted by sweeping porches and a courtyard. It features an open kitchen with a wood-burning oven and dining room. Next door, a rusticated two-story bar features exposed-brick. Sean Brock was the recipient of the prestigious James Beard Best Chef Southeast award in 2010. Prior to opening Husk, Brock had been the Executive Chef at McCrady's since 2006. Before accepting that position, he was the executive chef at the Hermitage Hotel in Nashville and the executive sous chef under Chef Walter Bundy of Lemaire Restaurant at Jefferson Hotel in Richmond, VA. He began his career as chef tournant under Chef Robert Carter at nearby Peninsula Grill in 1999. In the spring of 2013, Brock expanded with a second location of Husk in Nashville. Husk was named one of the Best New Restaurants in America by Bon Appetit Magazine in 2011. has been a regular selection on the EATER 18 list.